Did you know you have a widespread receptor system that interacts with the compounds in cannabis? 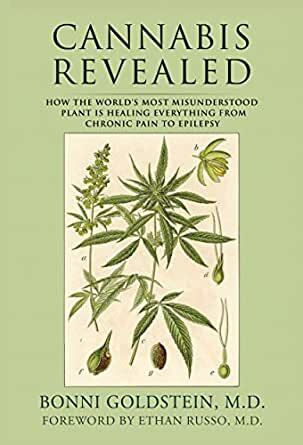 Cannabis Revealed is the only book written by a medical cannabis specialist, explaining the science behind the use of this amazingly therapeutic plant and describing in easy-to-understand detail the recently discovered endocannabinoid system, involved in almost every human physiologic process. Although 28 states have medical cannabis laws, most physicians are reluctant to discuss how this plant may be beneficial to health. Over 4 million people in the U.S. are healing difficult-to-treat illnesses with cannabis medicine. This book is an educational tool for patients and their loved ones who have not found answers with conventional medicines. Written by Bonni Goldstein, M.D., a well-respected practicing physician in California, and owner and Medical Director of Canna-Centers, this book explains the scientific research for over 28 chronic medical conditions for which cannabis is being used with positive results. Having helped thousands of suffering patients – including children – find relief with cannabis, Dr. Goldstein shares her expertise and years of clinical hands-on experience in chapters like How to Use Cannabis as Medicine, The Safety Profile of Cannabis, and Medical Risks of Using Cannabis, as well as true stories of how cannabis medicine has improved the lives of her seriously ill patients. As medical cannabis laws continue to evolve, it is more vital than ever for patients suffering from life-changing medical conditions to understand the benefits of this plant in an honest, medicine-based perspective. Educational, practical and comprehensive, Cannabis Revealed exposes the truth behind cannabis so patients can make informed decisions and improve the quality of their lives. Bonni Goldstein, M.D. is a physician who specializes in cannabis medicine in Los Angeles, California. She specialized in Pediatric Emergency medicine for years before witnessing the amazing benefits of this treatment in an ill loved one. Since then, she has successfully treated thousands of adult and pediatric patients with cannabis. She regularly speaks about cannabis medicine at conferences and patient groups around the world. She is the owner and medical director of CannaCenters and medical advisor to Weedmaps.com. Dr. Goldstein was awarded "2017 Medical Professional of the Year" by Americans for Safe Access. Super easy read. Love the case stories. I know Dr. Bonnie as I lived in San Diego, CA. A lot of my friends used her to help their children with Epilepsy use cannabis. She is so knowledgable. Thank you Dr. Goldstein for writing this amazing book. I have a son with an autism diagnosis and I used medical cannabis for him for 2 years while I lived in CA. We saw so many gains, most Importantly my son had an improved quality of life. He was happier and able to understand his worlds much better. We saw improvement in his IEP goals, increased fine and gross motor function, less anxiety, decrease tummy bloat, improved digestion, improved cognition, improved mood, ability to learn increased, frustration decreased, speech improvements and decreased brain inflammation. I know because he had a big lump on the back of his head that softened and got smaller. Cannabis heals. It is a God given plant meant to heal us. It was used for centuries as medicine before greed took over and made it illegal. We have an endocannabinoid system. We create our own cannabinoids called endocannabinoids. Dr. Bonnie explains it more. 36 people found this helpful. 5.0 out of 5 starsRemarkable New Book by an M.D. As a licensed medical cannabis patient in California I was astonished by this book. With a very personal interest in this subject I've read many books on medicinal cannabis and researched the subject. However, now comes an extraordinary book on medical cannabis written by an actual and very experienced cannabis doctor. A REAL DOCTOR with impeccable credentials, experience and bravery who has worked with cannabis patients since 2008. While the book is clearly science-based, the clarity and writing style make the book accessible to any individual who wishes to learn about cannabis based medical treatment for themselves, or, as a potentially life-saving gift to a family member, friend or associate that has medical or psychiatric conditions. I truly believe that anyone who reads and/or shares this book will never regret it. Rather, they may just help save their own (or someone's) life. Or, at least, improve the physical and mental condition of so many millions of us who are frankly victimized by certain significant forces in the Medical Establishment. To learn that the essential Endocannabinoid System (ECS) was only discovered in the last several decades is a partial excuse, but, at the bottom line, the fact that this new knowledge (the ECS) is not taught in medical schools is strong indication of how we are all controlled by forces that do not have our best interests at heart. Those that practice Financial Medicine; and, keep the few (but growing number of) legitimate physicians who have learned about the value of cannabis in healing from coming out publicly, because they are in fear of losing their license to practice medicine. This is beyond tragedy. Yet, the good news is that the negative myths and stigma regarding medical use of cannabis is dissolving. The fact that this book exists is proof that. From here it seems logical that a caring and nurturing WOMAN physician has opened the doors − given us essential previously hidden information. Congratulations Dr. Bonni, you've done a great job!!! 26 people found this helpful. I just finished Dr. Goldstein’s book. It could be the most important book on the treatment of medical issues you’ll ever buy. She clearly explains for us lay people the main aspects of cannabis and its medical applications. Doctors, along with anyone in the medical field, should also read this book. Each section is backed up by numerous references to scientific studies. Cannabis has been used as a medicine for thousands of years. It’s a crime that it was made illegal in the early 1940’s. The fact that it has medical benefits is undeniable. It’s hard to read the numerous patient stories in the book and not be moved by the amazing results. As Dr. Goldstein said, “it’s not a miracle, it is medicine.” I hope everyone gets a chance to read this book. It is good information about different diseases and conditions with different forms of Cannabis that can help. My husband was diagnosed with Parkinson July of 2016. With Doctor Medications, nutrition, Shaklee Vitamins and CBD liquid it has kept it limited to hand tremors. So the book was very helpful when navigating the world of Cannabis. It covers different ailments and was very interesting to read for anyone that is interested. Great information. So much more to cannabis than THC,. And cannabis is illegal because it helps people and makes their painful lives better? Pharmaceutical drugs kill about 200,000 people per year, there are addictions, and crazy long list of side effects. Cannabis has a history of zero deaths, and side effects may include the giggles and munchies.